Handbook on Japanning for Ironware, Tinware, Wood etc. 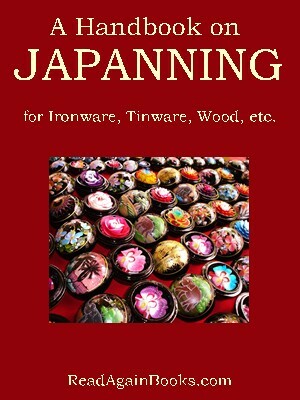 A Handbook on Japanning for Ironware, Tinware, Wood etc. Japanning is the art of covering paper, wood, or metal with a more or less thick coating of brilliant varnish, and then hardening by baking it in an oven at a suitable heat. With Thirteen illustrations in Black & White. SECTION IV. The Enamelling And Japanning Stove—Pigments Suitable For Japanning With Natural Lacquer—Modern Methods Of Japanning With Natural Japanese Lacquer. File Size : 995kb approx.